Proj #3: Fun with Portals! I….like Portal? I don’t actually remember why or how I even decided that the theme would be portal. I guess I thought it would be amusing to watch a unicycle play with a portal gun. 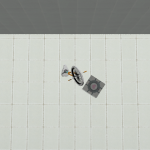 Then I decided that the portal gun would be too much, so I opted to just have the portals already in the test chamber. I’d have the unicycle look around like it’s confused. Then spot the orange portal on the ground, speed up to it and circle it a few times. This is kind of where my original idea and implemented idea differed. I didn’t want to have to add more to the scene by duplicating the room to create that reversed mirror effect (may have been achievable by using extra camaers, actually), so I chose to keep the portals their solid gradients. Losing that ability to mimic the effect meant that I couldn’t have as much fun with the portals. 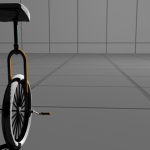 For example, I couldn’t have the unicycle go halfway in, and look back at itself, etc. So the next logical thing to do was either have it jump in or have it accidentally fall into the orange portal as it’s looking up at the blue portal [loses its balance]. The gung-ho jumping in idea was kind of trashed when I realized that wouldn’t have as much control over the unicycle once it’s in the portal-loop. My boyfriend solved the last bit for me – getting the unicycle out of the loop. He suggested I’d have something whack into it. So…I hit it with a weighted companion cube. Which sends it flying off, tumbling unto the ground – pretty much wears it out to the point it doesn’t want to move. 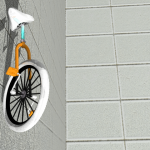 Seeing as the concept is Portal, I textured the unicycle to have similar coloring as Chell. It just made sense. Also, I wanted it shiny and reflective, so most of the materials are Blinn-based. Ramps were used to create any gradients, as well as the tires. Similar to the red-wagon, a layered technique was used to get the bumps on the white tires, and the separation between the black material and white material. A UV Planar mapping was done on the seat to add the Aperture logo on the top and bottom faces. Just a bare test chamber with no observation windows, buttons, deadly turrets, etcetera. It kept things simple but still recognizable. I had 2 ambient lights to light up the whole chamber, with one creating the shadows. Two point lights within the portal to give them some sort of depth. And then a 3-point light constrained to the unicycle (hence the flashing as the unicycle moves), to keep it lit at all times. I had a camera constrained and aimed at the unicycle (“following”) for that 3rd-person perspective I wanted. Then there was a close-up camera aimed at the two portals for when the unicycle starts go through them. And then a third set a bit far back to capture the collision between the unicycle and the weighted companion cube. Now that I’m thinking about it, I could have approached the camera in a “security camera” fashion, which would still go along with the Portal theme. But I also do still like the following camera. I started off by setting the tire’s rotation ouput to the spokes’, axle’s, and pedals’ input rotation to ensure that all those pieces will move together. The wheel’s rotation was set as a driven key with the unicycle’s translation as the driver key. This let me forget about moving the wheel around all the time. I originally drew a CV curve to use as a motion path, but I can never get the polygon to orient properly. So instead of using an animation path, I keyframed the necessary frames to follow along that path. Editable motion paths and ghosting were my friends for this project. It helped me keep a check on my timing and have an good overall idea of how the animation was looking. 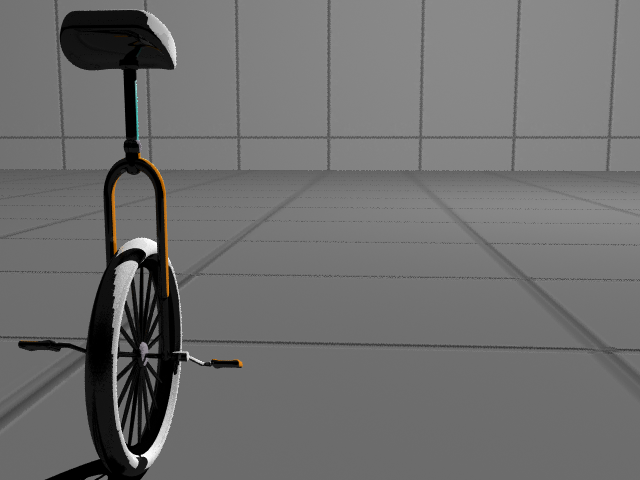 The seat group, and the seat + washer + seat pole were also rotated freely to add some sort of life to the unicycle. Overlap I tried to keep the unicycle’s motions overlapping overall. Disclaimer: This project was done solely for educational and non-commercial purposes. Portal/Portal 2 is a trademark of Valve Corporation. Most textures were either created to a likeness or were from my copy of Portal 2, with the exception of the simplified weighted companion cube texture which came from here.